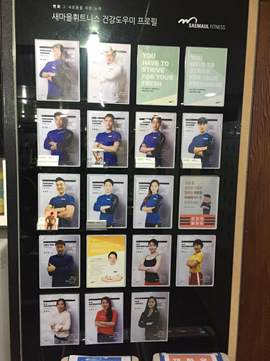 Saemaul Fitness offers 6 month and 12 month options for memberships and I signed up for the 6 month deal. The membership fee or health fee (헬스 이용료) for 6 months is 210,000 won or $35 Canadian a month which is more than reasonable. The 12 month membership fee totals 300,000 won and breaks down to $25 per month. 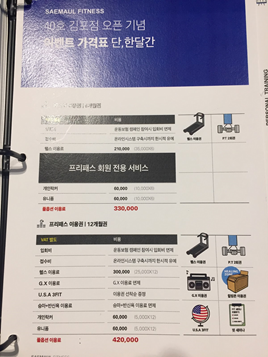 The full options package (풀옵션 이용료) including the healing zone and fitness class brings the 12 month total to 420,000 won. Also, if you have a Korean credit card, the option of dividing the payments rather paying a lump sum is available. However, depending on the bank that issued the card, it may be free of charge or there may be a extra fee. Personal trainers are also available and a great way to learn the proper mechanics and fundamentals of weight lifting and strength training for those new to the gym world. Quick Tip: A pay-as-you go option is also available for 10,000 won or $10 if you intend to use the club sparingly or need to go only a few times. 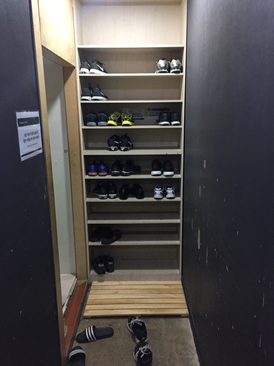 I have mentioned this before in my other blogs, when entering a locker room in Korea, there will be an area to remove your shoes and stash them until you come out. 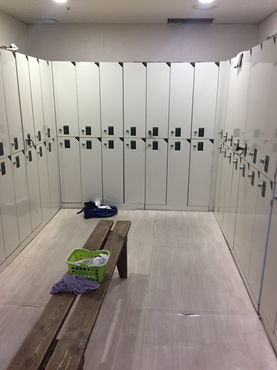 As you can see, with space at a premium in most places in Korea, the lockers are no exception. Just be mindful of other people who will be in your personal space and be patient as you change and use the facilities. A key with a designated locker number attached to a wristband will be given to you along with 2 towels and a uniform consisting of a pair of shorts and shirt. This is all included in the membership, but I personally never take the uniform as I wear my own workout gear. This is where the magic happens. Personally, lifting weights 6 days a week is the best and most effective way to maintain a healthy weight compared to just doing cardio or some diet fad. It helps me build and maintain lean muscle, strength, and endurance. I like to primarily focus on heavy compound exercises that involve multi-joint movements and work several muscle groups at one time. The bench press, deadlifts, and squats are my favourite as they target and engage the whole body. Of course, remember to get the proper nutrition and sleep to recover and grow. 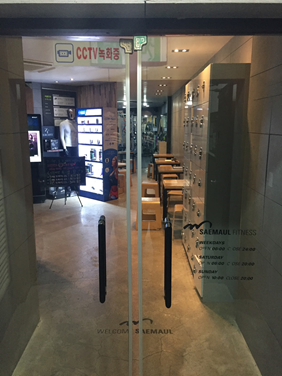 At Saemaul Fitness, all the proper modern equipment is available to exercise all areas of your body. The bench press, squat racks, free weights, weight station, leg press, and many more body specific machines are all ready to be used and conquered. 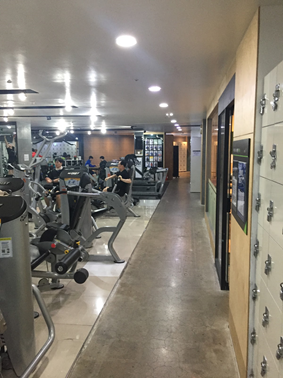 Quick Tip: Same as gyms in North America, it is proper etiquette in Korea to wipe down machines with a towel after using it and also put your weights back after using them. Doing cardio along with weights each day is an effective way to keep a healthy balance to my workout regimen. Running the treadmill while listening to my favorite music is fantastic way to get a natural high and release those feel good endorphins. I like to mix it up and also use the elliptical machine and stationary bikes. 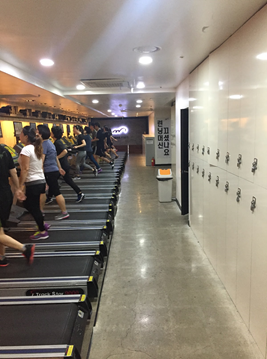 At Saemaul Fitness, the treadmills are all located in a separate area away from the weight room and there are plenty of them so you won’t have to wait for anyone to finish. 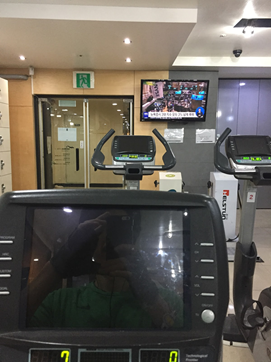 The elliptical machines and bikes are integrated with the weight room and located on the outskirts where you can watch television simultaneously. Quick Tip: Early morning is the best time to use the weights and equipment compared to the extremely busy evening time. 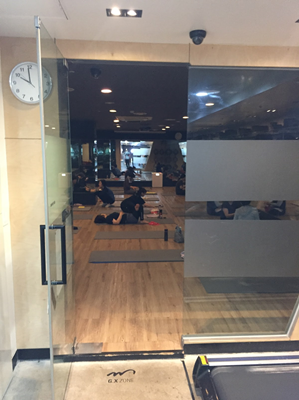 Just like gyms in Canada, Korean health clubs offer group fitness classes such as pilates, yoga, cycling, and kpop dancing. This is another option and fun way to break a sweat and get in a good cardio session if that is appealing to you. 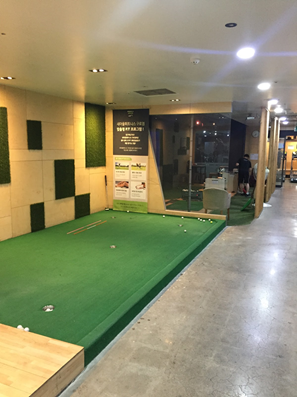 Many health clubs in Korea also have a segregated section for indoor golfing. You can practice your drive with an electronic interface and also your short game with a putting section. If inclined, there is also a golf instructor at the club for individual lessons. These are really popular especially during winter season. 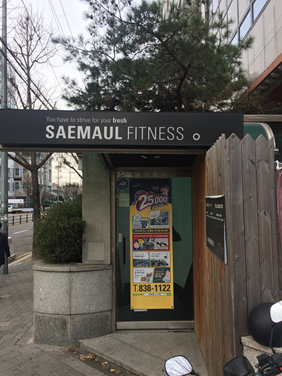 Getting a great workout at the local gym like Saemaul Fitness is one of the many ways to enjoy staying healthy and fit in Korea as a Chungdahm teacher. 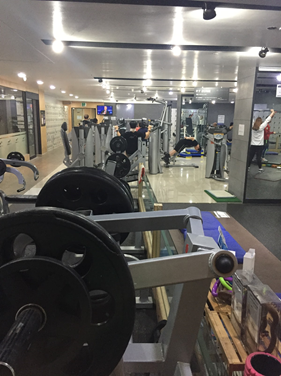 I have a habit of hitting the gym 6 days a week and I’m fortunate it is a 3 minute walk from my officetel in Seoul. As Chungdahm teachers, we all know Korea is a great place to work hard and play hard each and everyday.